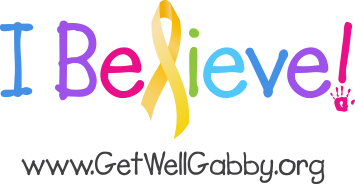 Now don’t forget Gabby is sedated every morning before treatment and then comes right back to start Therapy. Busy day for a tough little girl. This seems insane but remember it’s to get Gabby better and let her be safe at home when we finally get there. So while your children are out riding bikes and swimming at the local pool, Gabby is learning how to walk and use her left arm again. I don’t say this to sound harsh, just a simple fact at what she is going through. 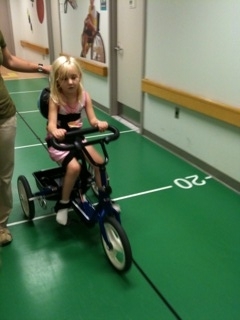 She needs a lot of help walking, and isn’t really able to use her left arm or hand very well. Someone sent a poem to the website. I apologize because at the moment I can’t think of the name. But the idea behind the poem was raising a sick child as opposed to a healthy one. The poem was sweet and poignant. Basically about learning and planning everything for a trip to Italy, but when you get off the plane you realize you’re in Holland. Now you can do two things: Be miserable you’re not in Italy or learn how to survive in Holland. For the last three weeks we have watched the perfect little girl we raised for the last five years change. Everything from not being able to cry to not being able to walk unassisted. I ask myself many times random questions all day. Will she laugh, will she cry, will she be back? (Yes to all those by the way!) Carolynn said something to me the other day: Be happy for what she is doing today. And it’s that easy. Two days ago she didn’t want to get out of bed, today I played the drums with her and watched her ride a bike for the second time since we’ve been here. I may not be in Italy, but I need to face facts and learn how to survive and love Holland. Also I keep coming back to asking myself why didn’t I realize how special all these things were the last five years? Why I would play a game on my phone rather than watch the smile on her face as she went down the slide at the park. Why I would fall asleep on the couch while she watched a movie as opposed to just watching her laugh at all the funny parts. I can keep going with these questions and I have over the last three weeks, I have replayed every time I yelled at her, didn’t pay attention, sent her to her room. What does that do ? Nothing! I wish I could say I’ll stop doing this, I won’t, but I’ll try. The one thing I hope you can take away from my post is, appreciate everything! Don’t waste time with the silly things. Put down the phone, turn off the X-box, if they don’t eat their vegetables today, chill out they will eat them some other day. If they break your most expensive piece of crystal calm down, it’s just stuff. It doesn’t matter. Watch them smile, watch them swing, remember every laugh not every tear. Cherish every hug, the smell of their hair. Cherish them. Nothing in life matters except for your family. It doesn’t matter if you are a millionaire or on welfare. The feeling you get when your daughter or son runs up to you, hugs you, and says I love you, is worth more than every rung you climb up the corporate ladder. I wish I knew that years ago. I guarantee I won’t every forget again. Gabby, Carolynn and I all got to participate in Music therapy, we played drums and piano together, this was the first time all three of us seemed happy at one time together since we’ve been here. Tired of hospital food Carolynn found a little Irish pub and brought in some Reuben’s and smuggled in a few frosty beverages for her and I which shall remained unnamed. So it was a good day for Gabby, She cried at times and wanted to go back to the room, but she didn’t. She stuck with it and kept moving forward, kept moving towards getting better. This is the spirit that no horrible diagnosis from any doctor can stop. This can’t be crushed or suppressed. She’s a five year old girl who wants to go home. And that’s where shes headed.